With its weatherproof construction and large viewing screen it is easy to see why this is considered the best RV backup camera. The full color display is able to produce a clear picture in low or bright lighting, and its impressive IP68 rating ensures that the RVS-770613 can survive being out in almost any storm. 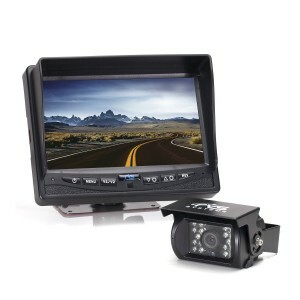 Designed to be easy to install and with all of the necessary connections included, this wired backup camera might be just what you need to help you safely park and drive your RV. Some consumers have noted that holes needed to run the connecting cables through are larger than other models and while drilling through a thin camper shell is generally not a problem, it can be difficult if you have to cut through thick stainless steel. If you do need to run the connector through a smaller hole most consumers recommend removing the large grommet and using caulk instead. This will not affect the camera’s performance, but it will make it easier to install on the back of the RV. The RVS-770613 backup camera comes with a durable construction that is designed to withstand almost any strom. The 2.1mm Sharp lens is protected by a metal casing that effectively protects it from cracks and scratches, and with an impact rating of 20 G this backup camera can survive occasional bumps and bangs. The cable connections are constructed from aircraft grade materials, and its IP68 rating you know that this RV backup camera is a good value for your money. With a pixel resolution of 800 x 400, the 7 inch viewing screen will clearly display any objects that are behind or beside the RV. The 2.1mm lens ensures that there are no blind spots, and with 18 infrared lights you never have to worry about being able to see what’s behind you in dark parking lots. The monitor comes with grid lines that make it easy to judge distances, and this convenient function can be adjusted or turned off as needed. The front controls make it easy to navigate the menu, and the RVS-770613 also comes with a remote. You will appreciate the removable sunshade which prevents annoying glare, along with the automatic dimming feature so objects always appear crisp and clear. It even comes with built in speakers so you can listen and watch DVDs. Rear View Safety designed this backup camera to be easy to install, and comes with all of the cables and connectors needed to attach it to your RV. The connectors are constructed from aircraft grade materials, and hook up easily to the “multiplexer”. Considered the “brains” behind this backup camera, it comes with 3 ports for cameras or even a DVD player and instantly sends the feeds to the monitor. A convenient trigger switch for each wire lets you control the cameras separately so you have complete control over what you see on the monitor.